Painter of Nebraska landscapes, western states, and other countries, Virginia Young Moon was somewhat active as an artist when a young woman and in later years made it her primary activity. Before his marriage, Virginia’s father, P.H., held a variety of jobs including that of stage coach driver, tourist guide in Yellowstone National Park, and overseer of two carloads of horses from Montana to Thedford, Nebraska. While driving the herd north in Nebraska, he was so impressed with the Sandhills that he decided that was the place where he wanted to live. His wife, Stella, had deeper ties to the region as her family were homesteaders in 1887 on the Niobrara River near Gordon, Nebraska. Stella’s mother, nicknamed “Kittie,” opened one of the earliest schools in Cherry County, and her commitment to education was continued by daughter Stella and granddaughter Virginia. Stella earned a certificate at Nebraska Normal College, now Wayne State College, and by age 16 had her own classroom. While growing up, Virginia attended school in Valentine, where her parents purchased a house at 330 North Cherry in 1917 so that their children could easily get back and forth to school during weather-changing seasons. However, to the family, “the ranch was always home.” (Beel 439) From 1925 to 1926, Virginia, then 19, was the teacher at a local school organized by Albert Erickson, a Valentine rancher. Of her teaching and utilization of her art talents, it was written: “She made school exciting with drawings on the blackboard with colored chalk, crepe paper costumes for songs and many other artistic projects.” (Beel 132) Virginia also focused on her own education by taking art lessons in Valentine from Ethel Rockwell, a well-known regional artist. In 1931, Virginia married Gale Alvin Moon, a Methodist minister, who had graduated from Nebraska Wesleyan University in Lincoln with a Bachelor’s degree in 1928. In 1930, he became minister of the Wood Lake Church in Wood Lake, near Valentine. When he and Virginia met, he was living in a rooming house. Gale was divorced, a circumstance which likely caused talk when he was courting Virginia, especially since he was a ‘man of the church.’ However, his marriage to Virginia likely eluded gossips because it lasted 66 years until Virginia’s death in 1997. The couple had two daughters, Loree and Norla. Until Gale’s retirement in 1966, he and Virginia had a peripatetic life around Nebraska where he served Methodist churches in Raymond, 1934; Lincoln from mid 1930s to early 1940s; Crete, 1942 to 1946; Kearney to 1963; and Chadron, 1963 to 1966. While living in Kearney, Virginia earned a Bachelor of Arts degree in Education from Kearney State Teachers College (now University of Nebraska at Kearney) in 1955, and while a resident of Lincoln, she studied art privately with Olive Bagg Dye. Virginia converted her sketches to realist-style oil paintings and offered them for sale through the Spectrum Gallery at Estes Park, or gave them away to friends. By her count, her paintings were owned by persons in 13 states and Canada. She said: “The best compliment I ever had was from a lady who saw one of my oils in the home of a friend and said, ‘That’s real!’ She meant it was not a photograph or a print or a copy, but an on-the-spot rendition. And so it was.” (The Senior Voice) Among her subjects were images of pyramids in Egypt, midnight sunsets in Alaska, and buffalo on the American Great Plains. 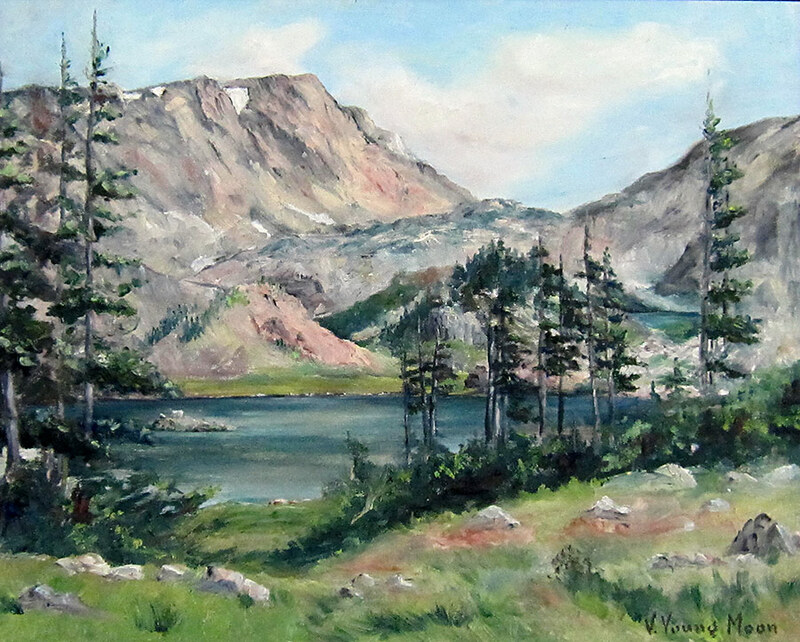 The Museum of Nebraska Art in Kearney has one of her mountain scenes, Two Lakes, Snowy Range, Wyoming, and also organized an exhibition which included four of Dorothy’s Wyoming landscapes; a Colorado landscape titled Terrific Terrain; a flower and fruit still life called Geranium With Apples; ranch scenes; a southwestern cactus landscape, and two Nebraska landscapes titled Sandpit Splendor (Kearney) and Cabin on the Upper Platte. Virginia Young Moon died on August 21, 1997 at age 91 in South Sioux City, Nebraska where she had moved with her husband. He died six years later in 2003. In addition to her artwork in the collection of the Museum of Nebraska Art in Kearney, her painting, Sage Brush Country, was in an exhibition of noted Nebraska artists organized by the Nebraska Art Council and titled Nebraska Art After 100 Years: A Statewide Centennial Art Exhibition. The Museum of Nebraska Art has one work by Virginia Young Moon.